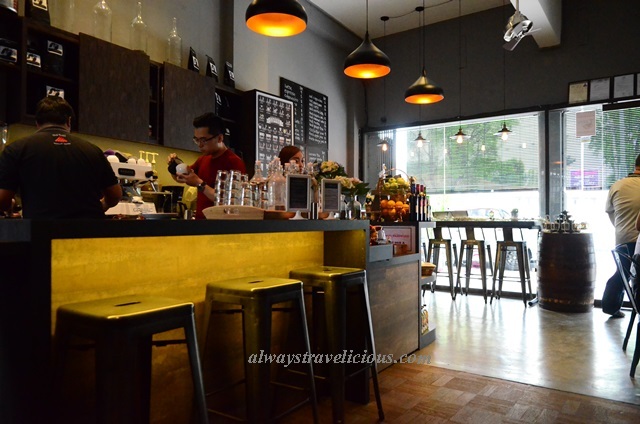 Coffeeright Place @ Ipoh - Always Travelicious ! Coffeeright Place is a quaint little cafe that’s spicing up Jalan Kampar with the skylines of New York – presented in black and white while highlighting some of the buildings in brilliant colors making them lively and lego-like. I haven’t had chai latte in a while and it was comforting with an abundance of spices with cinnamon being the dominant flavor (RM 10). Coffeeright Place is a non hala cafe so yay ! You get pork dishes here ! The black pepper baked rice with pork was heavenly (RM 15)! 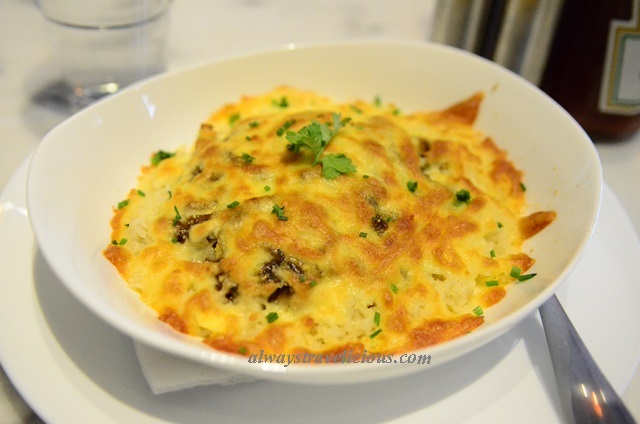 It looks a bit like omelette actually but in fact it is a lavish topping of melted cheese that forms this luscious golden blanket, covering an extremely peppery piece of pork and caramelized onions that rest on a bed of fried rice. The price of the items in the cafe may seem pricey at first glance like most boutique cafes in Ipoh, but the portion is decent and the main dish was enough as a complete meal, which is a good thing. The bad thing is I don’t get to try their delectable looking desserts – especially the adorable macarons. The items on the menu include nasi lemak, assam curry laksa, all day breakfast, eggs in the range of RM 10 to RM 16. The drinks of coffee and tea are in the range of RM 5 to RM 15. Opening Hours : Daily 11 am – 9 pm. I celebrated my 16th birthday here and all I can say that it was magical! The food was heavenly, the environment was nice as it has a small garden of greens! I tried the Trio Burger which are three tiny little burgers with different kinds of meat; there’s fish, pork and chicken! I even gave the Nasi Lemak a try! It was out of the roof! The best part is that their service is fantastic! They sang me a birthday song and it was truly memorable! This is the RIGHT PLACE for me and I’ll definitely eat there again! 😀 good job!